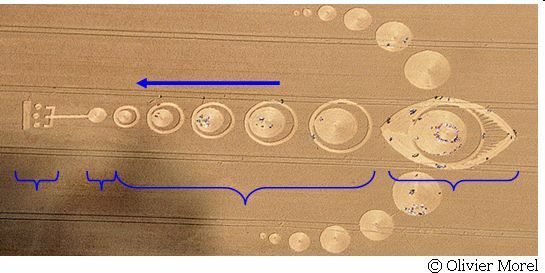 Today crop-makers compose many fake crop circles – hoaxes. Crop-makers use not only separate ETC symbols, but also combinations of ETC symbols forming ETC motives. Without understanding the contents of this motif, crop-makers put together ETC symbols into compositions of fake crop circles. In terms of learning to read ETC’ pictograms - this is normal, if there are no spelling errors. Being trained in reading, we use not only the abc-book, but also other books with stories and fairy tales. They allow us quickly and correctly to master language. Nobody will read the stories written by semiliterate writer with spelling and stylistic errors, putting the wrong cases and prepositions. 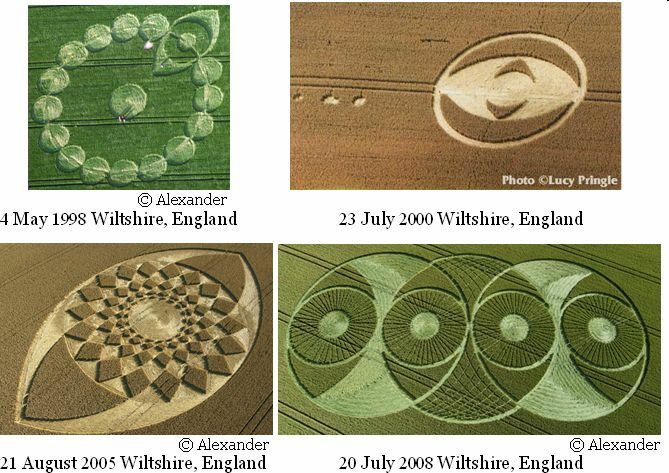 However, crop circles are not stories and fairy tales. Crop circles are ETC warning about the possible destruction of great civilizations of Earth in a very short time since the start of global cataclysms. From this point of view hoaxes are unacceptable. Crop makers concern it thoughtlessly and lightly. Crop-makers do not understand all responsibility which they bear. Crop circles are telegrams-lightning. These are the latest news which understanding will allow continuing our life. 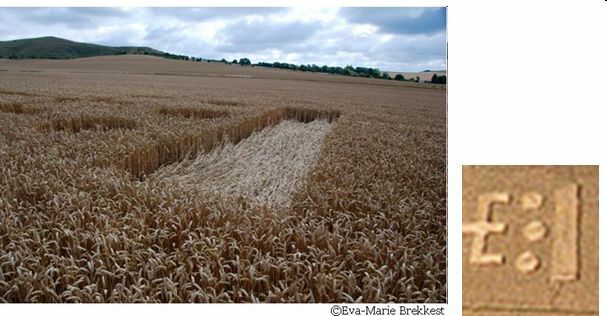 This crop circle pictogram at Alton Barnes 25 July 2010, Wiltshire, England by its content has no gross errors. In general it clearly transfers usual content of absolutely all ETC messages. However, some elements of this composition are apprehensive, because some places of this crop circle are made not quite accurate. Some combinations of symbols are introduced for the first time. For the first time in several years appeared a pictogram presenting simultaneously two principles of ETC coding – analogue and digital. An information cell is the bases of the analogue principle of ETC coding. An information cell is a representation of human being at information level of the Universe. A trident is the basis of the digital principle of ETC coding. It is also a representation of human being. However, a trident is a quantitative symbol. It shows that the consciousness of human being corresponds to the fourth level. 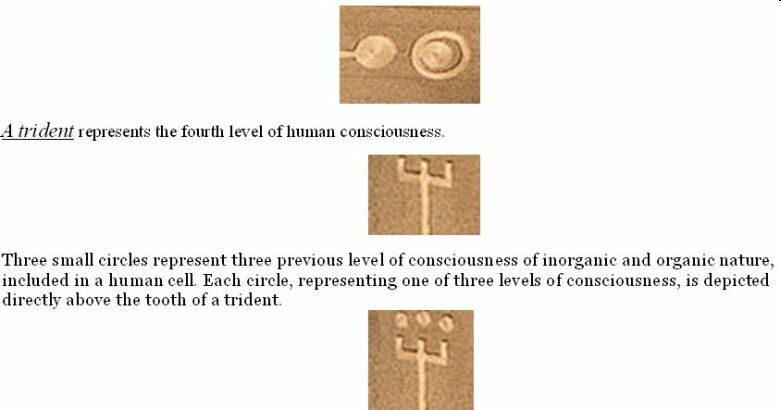 A trident also informs that our information cell includes three previous levels of consciousness. An information cell and a trident are symbols-analogues because they transmit the same information about consciousness of a human being. A quantitative principle of ETC coding the most widely is used in the Nazca Lines. The largest image of a trident «the Candelabrum of Parakasa» in height of 250 meters is on a rock in Peru. «Candelabrum» opens a gallery of the Nazca Lines. A trident represents a head of the Spider, a paw of the Hummingbird and other Birds. «Dancing hands» also consists of tridents. A trident is presented also in the crop circles. 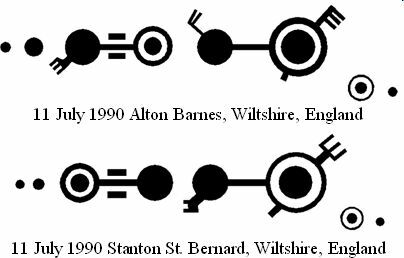 Thus, two sensation pictograms of the 90's that have arisen in the same day 11 July 1990 Wiltshire, England, also contain tridents and information cells. These pictograms inform about the necessity of transition of human consciousness from an individual mode in a mode of the united consciousness. The trident is presented also in one of the longest pictogram which appeared on 12 June 1999 Wiltshire, England. It combines many classical symbols and information blocks. The pictogram informs about two cycles of mankind’ life on a planet and necessity of the united consciousness formation. Depending on the transmitted information tridents can be in different combinations. A trident with a symbol of a planet (fig. 1) informs that on a planet the fourth level of consciousness – human being develops. The combination of a trident with a united cell (fig. 3) means a cell of the united consciousness of Earth’ civilization. The fig. 2 shows that a trident can be of two types: short lines are located on one side or both sides. The handle of a trident which is called «a consciousness trunk» passes through the civilization’ unified consciousness cell. It means that all civilization is penetrated by the uniform united consciousness. 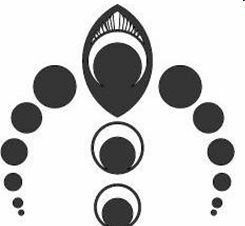 Unlike a trident a symbol shown below with two short lines informs about two cycles of consciousness on the planet Earth - a cycle of Consciousness and a cycle of Correction. Now we live and make decisions in a cycle of Consciousness. This cycle comes to the end. In the nearest future we should make the Transition to a cycle of Correction which will pass on the Highest level of the material world. ETC help us to make the Transition from the cycle of Consciousness to the cycle of Correction. • the consciousness line. It is the main line located horizontally. • the line of planets is a semicircle on the right part of the pictogram. A line of planets has the axis of a symmetry which runs through the center of the consciousness line. In this position of picture the symmetry axis is located vertically. Concerning an axis of symmetry the line of planets contains six circles, with a diameter increasing to the centre. The central element is a symbol of «eyes». It also contains a circle of the greatest diameter. Thus, the line of planets contains seven circles. It means that the pictogram tells us about the seventh planet from the end of solar system – the planet Earth. ETC are always counting the planets in the solar system towards the star, since in that order develops consciousness. The line of consciousness in this position is read from the right to the left. The right end starts from the symbol «eye». Left end finishes a wide vertical line. This line of consciousness includes 6 different symbols: a symbol «eye»; 5 circles with the shifted brain’ area; a circle, presenting a brain area of an individual cell; a trident; three small circles and a wide vertical line. Let’s consider all these elements. 1. The symbol «eye» - eye of dematerialization not only begins a line of consciousness. It lies also at the intersection of two lines of the pictogram - the line of consciousness and the line of planets. The symbol «eye of dematerialization» is a culmination of all pictogram- its informational goal. Usually in the centre of the «eye» symbol the united consciousness cell in not excited state is represented, i.e. the brain area is located in the centre – the crop circle of 21 July 1994 Wiltshire, England. In this pictogram the unusual eye is represented. It shows the excited state of the cells forming the unified consciousness. The pictogram tells that the united consciousness cell is formed by a shift of a brain area to the cell’ border. As a result of this shift a crescent of the united consciousness is formed. From one side of «eye» symbol many strips are presented. It is a symbol of a body transformation. 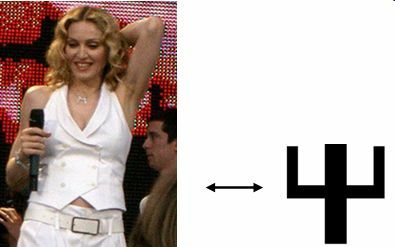 The symbol of a body transformation. The symbol of a body transformation is shown by radial strips going from a brain area to a cell’s border, i.e. crossing out a body area of a cell. 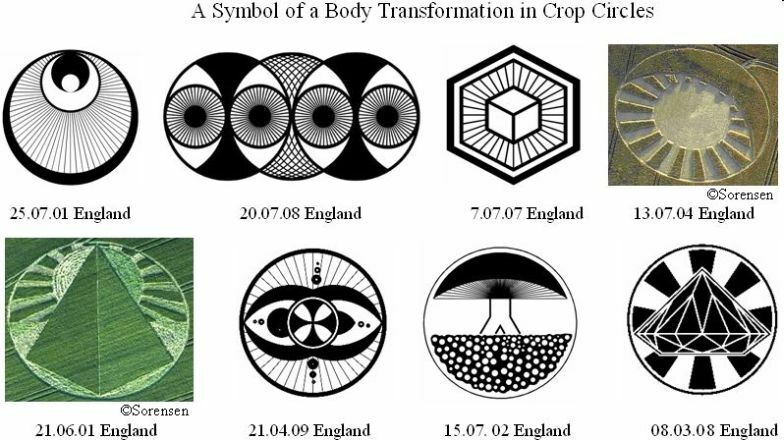 ETC already show in crop circles many pictograms with a symbol of a body transformation. Attention 1. According to ETC dictionary the symbol of a body transformation by definition should cross out area of a cell’s body, showing, thereby that body will be removed from the level of the Crystal structures where we now live. Hence, at the moment of the united consciousness formation our body will disappear from the level of the Crystal structures. The brain area of a cell is completely different world - in information and it is not subject to any transformations in the material world. This shows all ETC pictograms with the symbol «eye». Pointed oval of dematerialization is obtained by superposition of brain areas through association of consciousness. 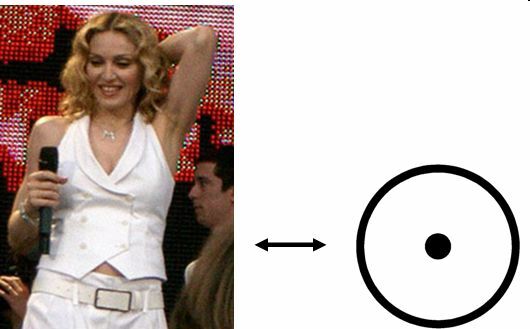 Therefore, on a pointed oval can not be put the symbol of a body transformation. It is possible to show abstract elements, such, as, for example, magnetic field symbols. So, a symbol of a body transformation cannot be put on a brain area. 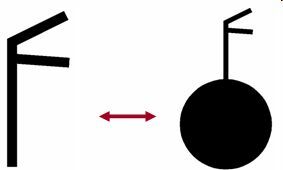 However, in the given pictogram the symbol of a body transformation is shown on a pointed oval, i.e. on a brain area. It is inexplicable from ETC theory of consciousness point of view which is presented in their symbolic. Besides, as strips cross out body area, they should go from cell’s border, but on this pictogram strips go from a contour of a pointed oval. Consequently, strips are placed on the wrong area. 2. Five circles with the shifted brain area inform that it is necessary to form the unified consciousness of civilization, which corresponds to the fifth level. A shift of a brain area, as noted in the previous section, is formed at the formation of the united consciousness. Carbon basis of our life. The symbol «eye» also contains the symbol with shift of a brain area; therefore all symbols with half moons will be six. It specifies on a carbon basis of our life. Last two circles ending the line of consciousness at the left have identical size. However, the circle on the right presents the process of the united consciousness formation. It is a shift of a brain area. It means that it is brain areas of individual cells. Attention 2. As we have noted, a trident is a key to a quantitative principle of coding. Each tooth of a trident means separate level of consciousness – the first, the second and the third. All of them are the previous levels of consciousness entering into a cell of human being corresponding to the fourth level of consciousness. Only human being has a cell with the central arrangement of a brain area and its mobility. All previous levels of consciousness have different structure of a cell. Three small circles shown near each tooth of a trident are brain areas of individual cells that do not correspond to cell structure. The wide vertical line located perpendicularly of the line of consciousness, means its end. It is a warning that the individual consciousness – it is a wrong decision. Mankind should change the mode of consciousness from individual to the united. Otherwise the line of consciousness of Earth mankind will be terminated. Here's how this looks on fields. CONCLUSION. There are two moments that do not correspond to ETC’ theory of consciousness. The quality of this pictogram manufacturing also pushes on thought that this pictogram is man-made.